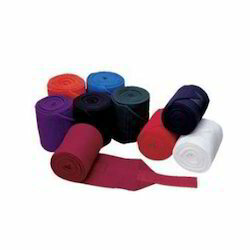 Pioneers in the industry, we offer horse acrylic bandage, bungee trailer tie, bridle covers, acrylic saddle cloth, cotton saddle cloth and wool saddle cloth from India. We are remarkable entity, engaged in manufacturing, exporting and supplying a superior quality Bungee Trailer Tie. 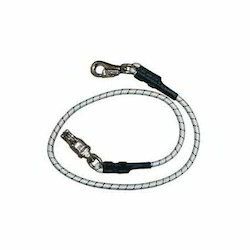 This range is highly durable & capable to protect the horses from sudden pulls and jerks. This tie is beautifully designed by our designers using quality approved fabric and latest weaving technology. 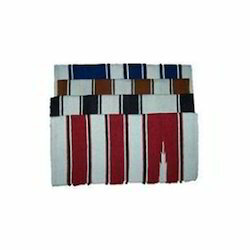 Furthermore, these ties are available in different style and patterns to our customers at market set prices. 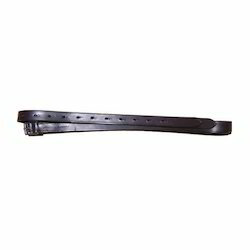 Length: 32" / 37" / 52" / 60"
Our reputed organization is involved in offering a wide gamut of Bridle Covers that are tested on well defined parameter before final dispatch in order to deliver best quality product to our clients spanning all over the world. 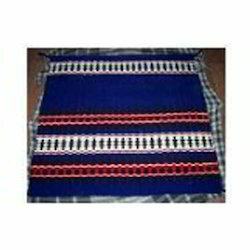 We offer these covers in variety of sizes, patterns and designs. In addition to this, our covers can be purchased by our clients at industry leading rates within promised Time-frame. Owing to the immense experience in this domain, we are providing an excellent range of Acrylic Saddle Cloth. Our offered range is fabricated using high grade threads and latest technologies. Our provided saddle cloth especially made for horses that are used to cover their bodies in winters for providing them warm feeling. In addition to this, the saddle cloth offered by us is appreciated by our clients for its elegant look and stylish patterns. Apart from this, our provided range is designed while keeping in mind the client's requirements. 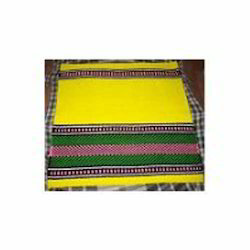 The goodwill we have gained in the market is due to our offered Cotton Saddle Cloth. The entire range is fabricated by using optimum quality material by our skilled designers. In order to ensure quality of the offered saddle cloth, our quality controllers test the this saddle cloth against various parameters. These are light in weight so that provide utmost comfort without harassing the horses. Keeping in mind the diverse requirements of our clients, we provide the entire range in different sizes, colours and patterns. As a quality-oriented organization, we are focused to provide our clients excellent quality Wool Saddle Cloth. The entire range is designed by using latest knitting technology and quality tested fabric. This saddle cloth is tested by our quality controllers to deliver defect free product. According to the taste of clients, we offer entire range in various designs and attractive patterns. 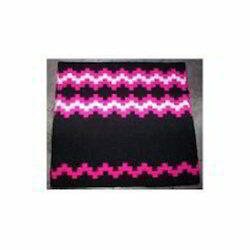 Apart from this, client can avail this saddle cloth from us at market leading prices. 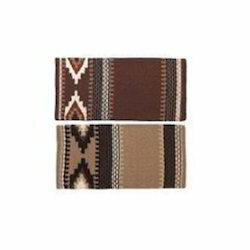 To meet our clients requirement in a satisfactory manner, we are engaged in offering a wide assortment of Saddle Cloth. Our offered saddle cloth is tailored using superior quality fabric and sophisticated technology. This saddle cloth is extremely comfortable to our customer’s horse. Apart from this, our saddle cloth is tested by the quality controller to deliver defect free range. In addition to this, clients can avail this saddle cloth from us at affordable prices. Symbolic to all the success that we have gained in this industry remains our status as prominent manufacturer, exporter and supplier of a qualitative assortment of Wool Saddle Cloth. Our provided cloth especially made for horses that are used to cover their bodies in winters for providing them warm feeling. This saddle cloth is designed using premium quality fabric and latest technology in adherence with the set industry norms. The range of our saddle cloth can also be availed in different customized designs, colours and sizes as per the requirements of our clients. To meet the clients diversified needs, we are offering a wide collection of Wool Saddle Cloth that is stitched as per the latest fashion trends prevailing in the industry. 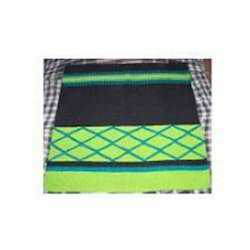 Our offering range is specially design for winters to provide heat to horse body. Our entire product range is skin-friendly and long lasting in nature. This saddle cloth is tailored using latest technologies along with the superior quality fabric in compliance with the set industry norms. Moreover, we are offering this entire range at most affordable rates. With the support of our dedicated team of designers, we are bringing forth an exquisite range of Wool Saddle Cloth to our esteemed clients. The offered range is fabricated by our extremely talented craftsman using premium quality material and latest techniques in compliance with the industrial norms. Our clients can avail this range from us in different colours, designs and patterns, as per their specific preferences and tastes. - Made from fine quality light weight fleece fabric. - Velcro closure at end.